Today’s was really hard for be because 1) I have a lot of favorite scenes and 2) I don’t actually own a lot of the books that my favorite scenes are from, so I can’t rewrite the scenes here for you. Sigh. So I’m going to share one of my many beloved scenes (from a book that I actually own!). 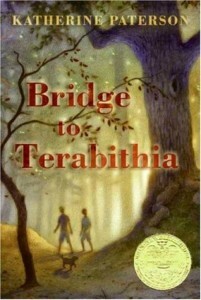 This is from Bridge to Terabithia by Katherine Paterson. Technically, it’s two different scenes, but they are only a few pages apart. If you haven’t read this book, the main characters are Jess (male) and Leslie (female), who are fifth graders in a rural country school. Jess comes from a poor, farming family, and Leslie’s parents are rich and a bit uppity, which is why they came to the country – to get close to the earth and get a dose of humility. These scenes are from Chapter 4, Rulers of Terabithia. Leslie named their secret land “Terabithia” and she loaned Jess all of her books about Narnia, so he would know how things went in a magic kingdom – how the animals and the trees must be protected and how a ruler must behave. Leslie’s favorite place besides the castle stronghold was the pine forest. There the trees grew so thick at the top that the sunshine was veiled. No low bush or grass could grow in that dim light, so the ground was carpeted with golden needles. “I used to think this place was haunted,” Jess had confessed to Leslie the first afternoon he had revved up his courage to bring her there. At first he heard only the stillness. It was the stillness that had always frightened him before, but this time it was like the moment after Miss Edwards finished a song, just after the chords hummed down to silence. Leslie was right. They stood there, not moving, not wanting the swish of dry needles beneath their feet to break the spell. I love it when books blur the line between real and imaginary. There is nothing as powerful as a child’s imagination. Truly. As an adult, I delve into books to use my imagination again, and I suppose I use it when I write, but I will never be able to truly recapture that childlike belief and faith in – well, in everything. And here’s Karla’s choice today!